MANILA, Philippines – The Professional Regulation Commission (PRC) and the Board of Geology released results of November 2017 Geologist board exam expected on Monday, November 20, 2017 or in two (2) working days after the last day of examinations. 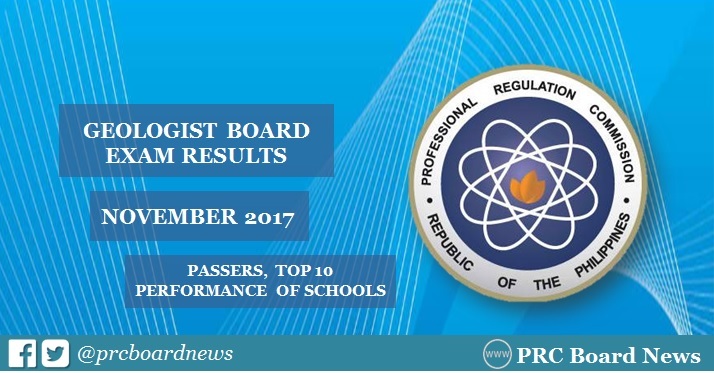 The official list of passers, top 10 (topnotchers), top performing schools and performance of schools are available on this page as announced online. PRC administered the Geologist board exam in Manila and Davao on November 14, 15 and 16. The top performing schools in the November 2017 Geologist Licensure Examination per Commission Resolution No. 2010-547 series of 2010: WITH 50 OR MORE EXAMINEES AND WITH AT LEAST 80% PASSING PERCENTAGE. The 3-day Geologist board examination covered the following subjects: general geology, petrology and mineralogy and applied geology. According to PRC Resolution No. 2016-1019, the target release of results of the recent BLEG is on Tuesday, November 21 or in three (3) working days. In the November 2016 exams, results were announced in three (3) working days. PRC named a total of 189 out of 395 who have passed the exams. University of the Philippines - Diliman (UPD) was hailed as the top performing school, 88.00% (66 out of 75).